Chalk this book up to a lesson learned. I thought that my reading had been pretty diverse lately, until I realized that I started to get disturbed at the beginning of this story, which is a cross between a fairy tale retelling and a traditional fantasy. Why was I disturbed? Because the heroine started to develop feelings for a talking polar bear.I realized that I have been reading WAY too much PNR and UF when something that should be a sweet fairy tale starts creeping me out because the bear isn't shifting right off the bat. What's wrong with me? Beauty and Beast was one of my favorite stories when I was younger.Once I got past my initial reaction, I let go and let the story take over. 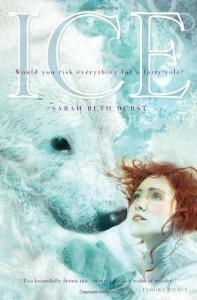 Soon I was swept into an epic journey of a girl that travels to find her bear king that was taken from her. I started to fall for the bear king myself (even if his name was BEAR....REALLY?). When the heroine finally saw him in his human form I was floored trying to picture what he looked like. I can't tell you or it would be spoilers! Let's just say that he sounded handsome...yet different.The story as a whole was a four star read, but I had to drop it to a three because the ending got cut a bit short for my liking.